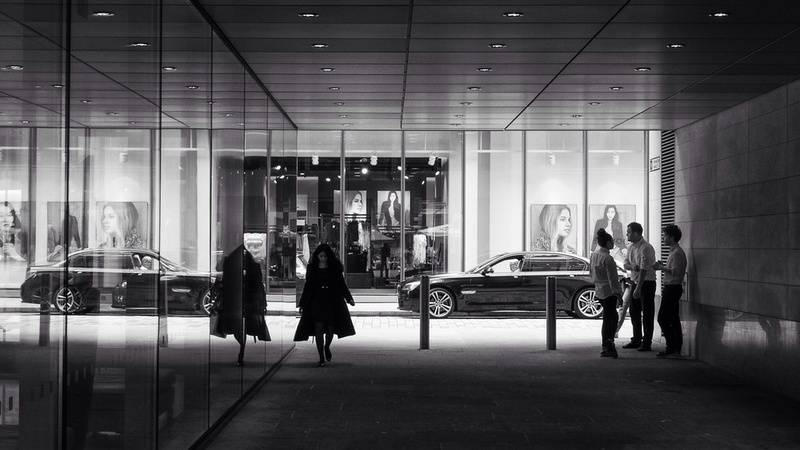 Musings about the art of photographing people. I quite happily confess I'm not an experienced portrait photographer. It's an odd conundrum. I work with people all the time in my musical life, directing ensembles and orchestras to achieve the carefully honed result I'm looking for. However, put me in front of an individual with my camera and I often feel completely out of my depth. I guess it's a training and experience thing. My many years of musical training and experience have taught me the techniques I need to create the musical sound and shapes I'm after. Ask me to do that as a portrait photographer and I feel much less confident in my ability, although, somewhere in my subconscious, I do feel that I could probably do it if the chips were really down. 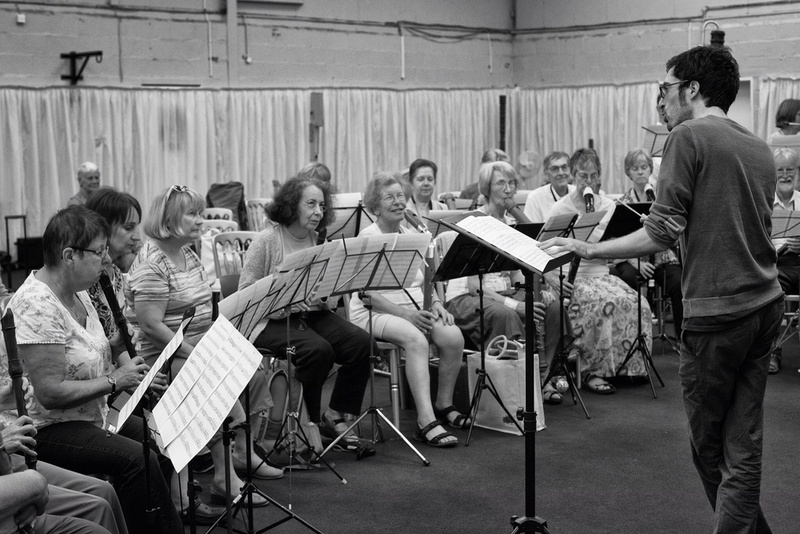 For many years now I have combined my musical activities with my photography, acting as official photographer for school concerts and events such as The Recorder Summer School and the National Youth Recorder Orchestra. The difference here is that I'm capturing a moment in time that would happen whether I was there or not. As I've mentioned in a previous blog post, in such situations I use my musical training as much as my photographic training to pick the right moment to click the shutter button to freeze that crucial musical or dramatic moment. One of my favourite portraits from the course I attended at West Dean College. This is Pamela, one of my fellow students. I took a big step forward from this type of people photography back in August 2010 when I attended a course with the press photographer Richard Cannon at West Dean College in West Sussex. The focus for the weekend was purely taking photos of people, both formal portraits and candid shots of folk in the street. I still felt all at sea when directing people in front of the camera but it gave me a little more confidence to photograph life on the streets and sometimes, just sometimes, to interact with complete strangers in order to take their photo. A year or so later my friend Sharon and I went to an exhibition of street photography in London and agreed that, as soon as we'd eaten our lunch, we'd try our hand at the art ourselves. I guess there was a feeling of safety in numbers doing it together rather than as lone individuals. We had a ball that day and it fired up an enthusiasm for photographing people that I'd never had before. Ever since that day I'll take a day here and there to do some street photography and while I still get a little nervous I really enjoy trying to capture what Henri Cartier-Bresson called 'the decisive moment'. Sometimes I'll get spotted and the subject of my photo will throw me a steely look of disapproval. However, on other occasions there will be a flash of eye contact and a warm smile as they clock what I'm up to and those moments make the nerves all worthwhile. I still wouldn't say I feel at home directing formal portraits but I just love this stealthier form of people photography. Just last week I found opportunities to follow this interest on two consecutive days. I had some time to spare while travelling through London and went to one of my favourite spots for people watching - the British Museum. I find folks tend to be in their own little world inside museums and there are all sorts of interesting moments to be captured as they interact with the exhibits and even the architecture. One of those magical moments at the British Museum - they almost seem to be communicating with each other! 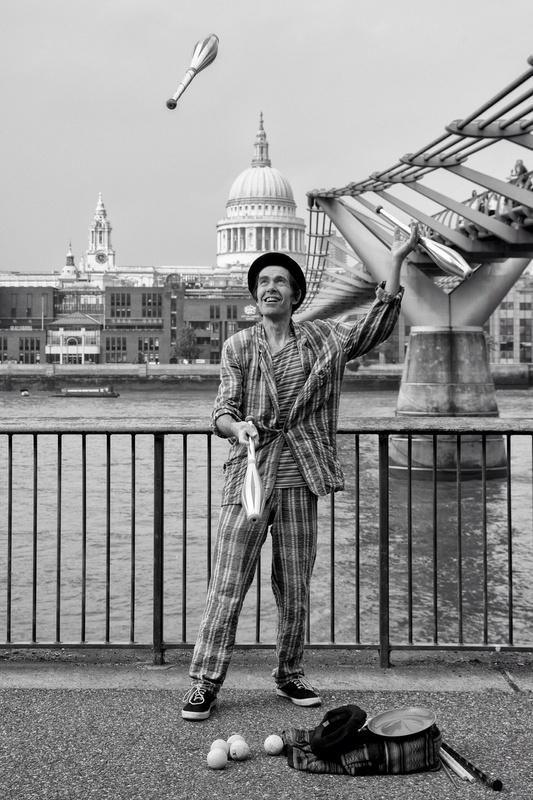 Another London street performer, this time beside the Millennium Bridge. This chap was an absolute joy to photograph. The following day I took part in the 500PX Global Photowalk, again in London, a group of some 50 photographers roaming the streets of London. We'd been given a theme of 'repeating patterns' to shoot for so I had expected to end up doing lots of architectural photography. As it happened though, the light on Saturday was very flat and not at all conducive to sculptural architectural shots so, once again, I found myself focusing more on the interesting people we met. 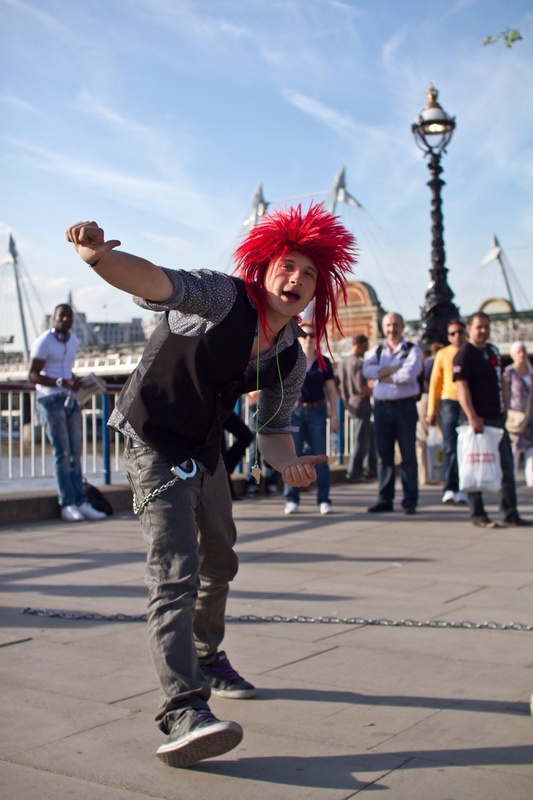 Many of my subjects were street performers, for whom being photographed goes with the territory. One of the moments that made me smile the most though was a shot that started out as a candid portrait of a chap on his mobile phone and changed into something altogether more interactive. Just as I focussed my camera he looked up and spotted what I was up to. Instead of glaring at me he gave me a warm smile and a thumbs up and there was a moment of friendly interaction which made me smile too. Today brought yet another opportunity for some observational photography of an altogether different type. Walking through the City of London I noticed a covered passageway near St. Mary-Le-Bow Church. At the other end I could see some advertising in the window of a shop, a parked car reflected in the window to the left of the passage and a selection of people walking past, silhouetted by the bright light beyond the tunnel. Thinking this might make an interesting composition I chose my spot, framed my shot and waited for the right person to walk into the frame. Then my luck really came. A group of local cafe workers paused to the right of the tunnel to have their cigarette break and to complete the image a lady in a dramatic black coat came around the corner, silhouetted and reflected in the window. Click went my shutter and I'd got a shot that kept me smiling all the way down Cheapside to St. Paul's tube station!